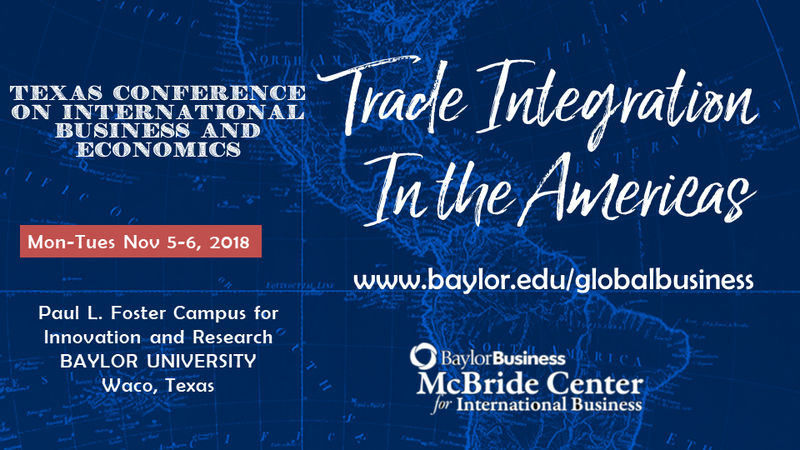 The Baylor University McBride Center for International Studies will host the Texas Conference on International Business and Economics and a policy forum Monday, Nov. 5, and Tuesday, Nov. 6. This will be the sixth conference Baylor has held on trade in the Americas. In 1989, Baylor was the first university to hold a conference to discuss the possibility of a NAFTA agreement. Even after 30 years of academic discussion and official negotiation, the Western Hemisphere has never agreed on a broad framework for cooperation, and NAFTA has recently been the subject of difficult negotiations, said Steve Gardner, Ph.D., Director of the McBride Center for International Business and Herman Brown Professor of Economics. Gardner said there is no better time to hold another conference as a new trade agreement is being discussed between the United States, Canada and Mexico requiring a congressional ratification. •	John Andersen, deputy assistant secretary for the Western Hemisphere at the U.S. Department of Commerce. •	Otaviano Canuto, Ph.D., member of the executive board of directors of the World Bank Group representing Brazil, Colombia, Dominican Republic, Ecuador, Haiti, Panama, Philippines, Suriname and Trinidad and Tobago. •	Alejandra de la Vega Foster, coordinator of the Security and Justice Bureau of Ciudad Juarez and president of Almacenes Distributidores de la Frontera. •	Lawrence P. Howorth, president and CEO of Howorth International and chair emeritus of the District Export Council of North Texas. •	Musheer Kamu, Regional operations advisor, Caribbean Group, Inter-American Development Bank. •	Vasken Khabayan, acting consul general, Consulate General of Canada in Dallas. •	Jorge Molina, independent consultant and faculty member at Universidad Panamericana and Tec de Monterry. •	William S. “Bill” Simon, retired president and CEO of Walmart, current senior advisor to the investment firm KKR and member of the Baylor Board of Regents. Attendees who are interested in conducting business with Canada and Latin America will be presented with practical insights on opportunities and challenges, and attendees who are interested in public policy will gain a deep and current understanding of issues. During the past 30 years, Baylor has hosted a series of forums on trade in the Americas, and now this subject has a special place in Illuminate, Baylor's new strategic plan. Gardner said the event is a way for students to learn from and network with a diverse group of high-level speakers from several countries and from business, government and international organizations. “This obviously provides a great opportunity for Baylor students to learn about the changing business environment that will influence their lives, but it’s also an opportunity to network with the business people and public officials who will come for the event,” he said. The academic conference will be held from 1 to 5:45 p.m. Monday, Nov. 5, and the policy forum will open with a keynote dinner on Monday evening and will extend through the day on Tuesday. For more information and a full list of events and speakers, visit the Hankamer School of Business website.